This is a guest post from Joe Laing. You can learn more about Joe in the bio box below. You don’t have to be a ‘bird nerd’ to appreciate the grandeur of hundreds of sandhill cranes circling overhead in unison, or a gaggle of thousands of geese creating a deafening roar as they settle in for the night at a desert lake. 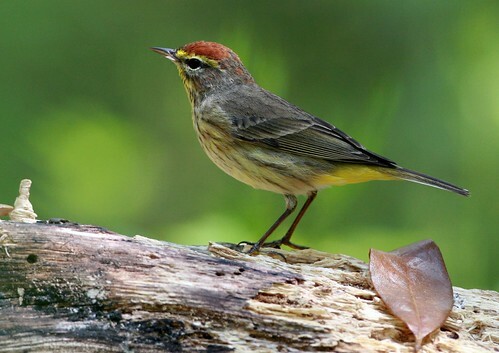 Although we won’t all plan our vacations with fingers crossed around the chance of spotting a glimpse of a rare tropical bird, anybody can find themselves awestruck by the spring and fall migrations across the United States. 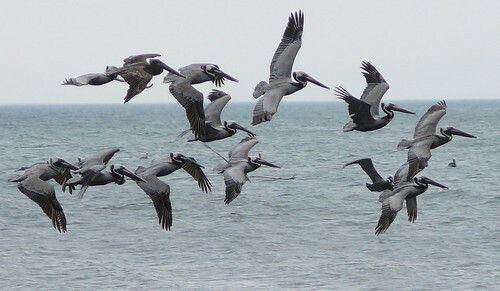 Brown pelicans can be spotted year-round throughout the Outer Banks of North Carolina. Few places feel more like you’re truly out on the edge of America than North Carolina’s Cape Hatteras National Seashore. In the spring, hundreds of thousands of seabirds descend on the narrow strips of sand and maritime forest jutting out into the ocean. Look out for terns, kites, and huge numbers of falcon-like jaegers. Late April and early May are peak season for migration, and some beach areas are closed to vehicles to protect the piping plovers that nest here — but, of course, a long walk on the beach is never an unwelcome diversion! Set up camp at one of many private campgrounds, or grab a spot at the four campgrounds operated by the National Park Service (including one on remote and beautiful Ocracoke Island, accessible only by ferry). Quite literally in the middle of nowhere in central New Mexico, Bosque del Apache is a rare oasis along the Rio Grande where the water spreads out across the desert, providing a haven and resting place for over 10,000 sandhill cranes and 20,000 snow geese. Fall is peak time, including the annual Festival of the Cranes in mid-November, but late April and early May are also abundant, with a high diversity that includes bitterns and herons (among 377 species spotted here in total). The Bosque Birdwatchers RV Park provides affordable nearby accommodation, where birders swap their ‘war stories’ after long, relaxed days exploring the refuge. At the Garden State’s southern coastal tip, Cape May serves as a ‘must see’ destination for over a million migrating songbirds each spring and fall. Sunrise is the best time to see the birds flock together, on their way to feed. From oystercatchers to swallows to egrets and osprey, the diversity of bird species in this marshy, sandy area is truly astounding, and you’re bound to encounter a few ‘serious birders’ along the way, hauling impressive camera lenses and spotting scopes. Even the amateur birder will appreciate the sheer abundance of feathered friends here, with many present year round. It’s also possible to camp almost directly on the beach at spots like the Seashore Campsites Campground. The soggy coastline of southern Louisiana has taken a beating in recent years from storms and the tragic oil spill, but migrating birds still flock there in huge numbers throughout the spring. The sandy ridges of oak that line the marsh near Grand Isle create a perfect haven for warblers, tanagers, orioles, and vireos. After the long flight north across the Gulf of Mexico, these welcoming woodlands present a much-needed spot to feed, rest, and refuel before continuing on their journey. Go in late April to catch a colorful array of over 300 species dropping in almost simultaneously. For comfortable camping, set up shop at Grand Isle State Park, directly on the beach at the island’s northern end. Translating to “lake that speaks” in French, this lake and state park in western Minnesota earned its name and reputation from the thousands of geese and waterfowl that stop here in the spring on their way north. 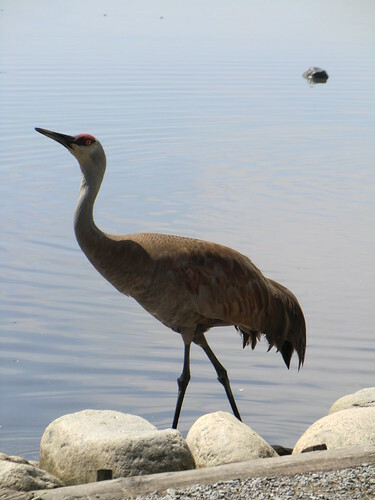 The 33,000 acre wildlife management area provides a refuge to ducks, sandhill cranes, shorebirds, and warblers, with cranes arriving as early as March and the others following throughout the spring. Year-round, keep your eyes peeled for bald eagles, many of which actually overwinter there. Lac qui Parle State Park includes an RV park with over 50 sites that include electric and water hookups. For family fun or a relaxing vacation alone or with a loved one, it’s often wise to follow the birds. The places around the nation that serve as stopovers for migrating flocks of birds double as some of the best unspoiled wild areas in our country. Where is your favorite birding hotspot? With havi so much content do you evedr rrun into aany issues off plagorism or copyright violation? poppig iit up all over tthe internet without myy authorization. Do you know any tewchniques tto help stop conttent fropm being stolen? invite you to tell him a bit about your own personal life.